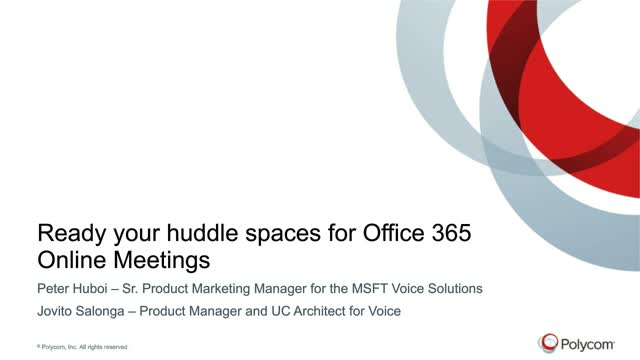 How the new Office 365 Services and Skype for Business Online change the collaboration experience and reduce conferencing/communications costs. How you can turn your conference rooms and huddles spaces into productive, collaborative workspaces. Polycom RealPresence Trio and how it accommodates our 3 collaboration needs: Voice, Content and Video. How easy it is to set up and how easy it is for users to connect. How flexible your workspace transition plan can be. Interested in learning more about huddle rooms? Our recorded webinar will give you all the information you need to create the best huddle room for your needs. What is a huddle room, and why are they growing so rapidly? How do you create collaborative workspaces that drive productivity and company success? Today, video-enabled devices allow people to work and communicate from virtually anywhere. “Work” doesn’t have to be a place you go to, it’s something you do, irrespective of time, location, and the devices you use. People want to talk with each other naturally, regardless of where they happen to be and expect that experience to feel no different from meeting in person—which is why they also want to see and share content. In this webinar, we’ll show you how you can enable users to communicate in open spaces while focusing on greater productivity and stronger team cohesion and collaboration. Polycom helps organizations unleash the power of human collaboration. More than 415,000 companies and institutions worldwide defy distance with secure video, voice, and content solutions from Polycom to increase productivity, speed time to market, provide better customer service, expand education, and save lives. Polycom and its global partner ecosystem provide flexible collaboration solutions for any environment that deliver the best user experience, enterprise-grade solutions, the broadest multi-vendor integration, and customer choice. Visit polycom.com or connect with us on Twitter, Facebook and LinkedIn to learn more.